Twitter is a massive network consisting of a ton of infrastructure, a lot of code no one ever sees, and millions of people. Nothing in the history of mankind has reached such a scale and runs flawlessly. If you’ve never encountered a problem with Twitter, consider yourself lucky; the thousands of employees they keep on payroll are doing their jobs well enough that you never have to see the underside of functionality. Wait for the issue to resolve itself. Search the internet for a solution to the problem. Option 1 isn’t very good. Some issues never resolve themselves on their own, and even if they do, you never know how long it will take. You have no way of knowing if the problem is an issue with your computer, your account, your internet connection, or Twitter itself. You simply have to wait, and that’s not proactive. Plus, depending on the problem at hand, it could get worse as time goes on. A hacker taking control of your account can deal increasingly more damage the longer they have access. Even just the inability to log in properly can result in lost business and angered customers. Option 2 is better, because at least it’s proactive. If you’re lucky, you’ll be able to find someone else who has experienced your problem, and who has an existing support thread on a site like Stack Exchange, MajorGeeks, or another support board. Ideally, there will be a commonly accepted, easy to implement solution that works, and you can go on with your life. All too often, though, this situation leads to frustration. Maybe the issue is a rare one, and you find numerous people asking for help to solve it, but no actual answers on what solution might work. Maybe the issue is uncommon but persistent, coming back every six months or so. You find people with the same issue from 2011, but the solutions posted don’t work any more, or the options involved have been moved. Maybe the issue is a new and common issue, but the solutions posted don’t work for you, and no one reads enough to know you already tried them and need something different. That leaves option 3. Contacting Twitter themselves will help you determine whether the issue is on your end or theirs. If it’s on their end, you will be able to work with them to get it resolved, or at least know that someone has been notified and that they are working to resolve it on their end. The trouble with this method is that it’s almost equally as frustrating as option 2. Some support methods are swamped with users clamoring for attention and never seem to respond. Others send out form responses and never seem to acknowledge specific problems. Still others refer to help documents that should help, but don’t, leaving you in the lurch. Only rarely will you get a good response. That’s why I put together this post. I initially started researching to find the best way to contact Twitter via email, but I realized something; it’s inefficient and rarely helpful. I decide to expand my scope to all forms of Twitter contact. If one doesn’t work, try the next, and the next, and the next. Sooner or later you’ll get an acknowledgement and the help you need. Before you go exploring support, there’s one very important thing you need to know: Twitter can be petty. You know how sometimes a person in position of authority will de-prioritize someone’s problem because they’re pestering or annoying about it? Twitter does the same thing. What this means is that Twitter replies to a support ticket sent through any of their systems in the order it was received. The thing is, they sort by sender. If you send a support message on Monday, and then again on Tuesday, and then again on Wednesday, they will ignore the tickets sent on Monday and Tuesday. Anyone else who sent a ticket before your Wednesday ticket will take priority, unless they too sent a second ticket after you. If you send a support ticket of any sort, send one and only one. Otherwise you’re just delaying the chances of getting a valid response. Additionally, Twitter’s auto-responder messages are very important. Here’s what they do. They check your support message for certain keywords and send you relevant support pages and forms. They assume that those will work to solve your issue. If they do not, don’t submit another ticket! You will be put at the end of the line and treated as a new communication. Instead, reply to the email you received. This is the only way to move past the auto-response stage of support. Twitter doesn’t really have a very good email support network. For all that we recommend that businesses use Twitter for customer support, Twitter themselves seems to have dropped the ball on this measure. More on that in a bit, though. You would think that Twitter would have an email for customer support, but you’d think wrong. Well, that’s not strictly true. They do have a support email account, but it’s very unreliable. GetHuman, a site dedicated to finding the most efficient methods of reaching someone with authority within any business, has no listed email for Twitter support. There are a few email addresses I’ve found, for various purposes, but they aren’t always reliable. The first email address on the list is support@twitter.com. This is, in fact, a general support email. It’s also incredibly unreliable. A lot of the time, when you send it a message, it will simply disappear. You won’t hear back at all. If you do hear back, chances are pretty good all you’ll get is a form letter based on certain keywords in your message. This might point you at a common solution to a problem you’re not having, or a link to a help center page that may or may not be useful or relevant to the situation. Twitter uses the JIRA service desk system for their email support, a fact I discovered when looking them up. The company behind JIRA brags that Twitter dropped their support from 95% via email to only 15%. Unfortunately, they don’t seem to have recognized the quality issues this brought up. Sure, a lot of support is handled by forms and by Twitter accounts, but email should remain a viable option. The fact is, it didn’t, and that’s a shame. The second email address I’ve found is partner@twitter.com. This address is not for support, though, it’s specifically used when approaching Twitter about some form of partnership. Chances are if you’re not a Fortune 500 company, you aren’t going to get the time of day from Twitter through this address. At best, you’ll be told to use a different support channel. The third email address is lawenforcement@twitter.com. This email address is, reasonably enough, meant for law enforcement to contact Twitter with important and confidential case issues. If you’re not a member of law enforcement working on a case that involves Twitter, don’t use this email. At best you’ll be ignored; at worse, you can find yourself with an obstruction of justice charge for taking up the time of the team behind this address. This is, to Twitter, the second-best means of contacting them, after their network of forms. I’ll go over those next. For now, though, if the forms don’t work for you, if you can’t log in, or if they don’t cover your issues, you can use a direct message or tweet to one of these accounts in order to try to get more direct support. Note here that I say try. That’s because there are issues with these methods just like there are issues with email. In this case it’s one of volume. Twitter may have cut out 80% of their email support, but they really just pushed it to other contact methods, like these accounts. They have millions of followers, so the chances of your support message being noticed, read, and acted upon are pretty slim. Still, it’s worth giving a shot. The first account is the dedicated support account. You can find it at @support, or https://twitter.com/support. They tweet tips and tricks and they handle some support, but again, it’s not necessarily all that responsive. They have 4.5 million followers and every message they tweet gets dozens of replies with support requests, often completely unrelated. I can only imagine how bad their direct message inbox would be if it were open. The second account is even worse; it’s the general Twitter account. You can find it at @twitter or https://twitter.com/twitter. It has almost 50 million followers and is even harder to get a response out of. Their tweets are often much more off topic than @support, too. The third account is @verified, which you can find by clicking https://twitter.com/verified. It’s an official Twitter account meant to be used specifically for the verification system. It doesn’t tweet, it doesn’t respond, and it only sends out direct messages to people who are earning verification. Maybe they will help forward a support message on, or maybe not; I don’t rightly know. Account Access. This section covers issues with logging in, deactivated accounts, hacked accounts, account suspensions, and account restorations. Features & Settings. This section covers issues with news, moments, notifications, emails, DMs, photos and videos, search, tweets and timelines, follows/followers, your profile, and the side services Tweetdeck and Vine. Violation Reporting. This section covers support for being impersonated, having trademarks violated, counterfeit goods, copyright violations, harassment, privacy issues, issues with private information, reporting spam, reporting bad ads, and reporting people who are posting about self-harm. Purchases & Offers. This section covers, fittingly enough, issues with purchases and with offers. Each sub-section is a link. Clicking on the link takes you to a sub-page that will help you with that problem, generally by giving you more specific options. For example, if I were to go report issues with notifications, I would click the notifications link in the Features section. This brings me to a page with three links. I can report a problem, send feedback, or search the help center. Clicking to report a problem takes me to a form where I can specify the type of notification – Push, SMS, Email, or Web – the location of where I experience the issue, the description, and means of contacting me. Filling out that form submits a support ticket. This is the method of getting support that Twitter obviously would prefer people use, because it’s passive and requires no attention from their staff. It’s a database of issues and solutions, which you can search. You can specifically use the help search up at the top of this page, or you can browse through categories. Using Twitter. This section includes answers to frequent questions, mostly aimed at beginners. These are questions like “should I protect my tweets” and “what is a hashtag?” Like I said; super basic stuff. My Account. 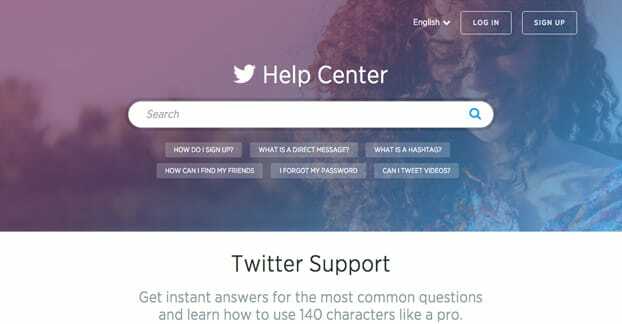 This section includes answers to other common questions, like “how do I protect my tweets” and “how can my friends find me?” Again, these tend to be basic questions, just more about using your account than using the site in general. Fix a Problem. 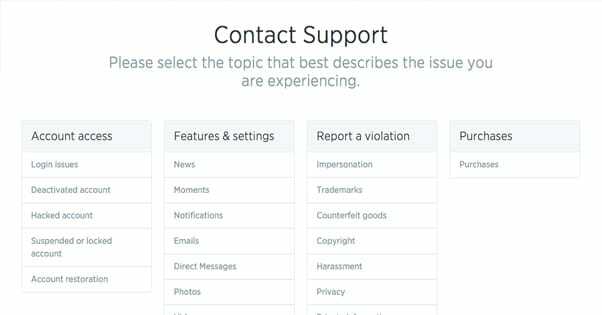 This section has issues like “I can’t log in!” and “Can I reactivate my account?” In general, these lead to support pages with a bunch of detailed information, which leads to various methods for contacting support, the rules that led to the issues you’re having, and what to do if you fall outside the rules. These are often where you will find links to the forms page. In general, the help section is valuable if your problem is a common one, but it doesn’t help at all with edge cases or when the usual solutions don’t work. You will have to move on to other forms of support in those cases. There are two other methods you could use to contact Twitter if all else has failed. One of them is quick and one of them is long, and neither is going to help you if support already won’t. The first is the mailing address. You can send something to Twitter, Inc. at 795 Folsom St. Suite 600, San Francisco CA 94107. I don’t know why you would, though. I can’t imagine they’ll be able to help you. The second is their support phone number. At last report, this is 415-222-9670. According to GetHuman, this typically results in a wait time of around 18 minutes. There are other numbers listed, but this is the current most highly recommended option. If even a phone call fails you, I don’t know what to tell you. There’s nothing to be done. You’re just going to have to go back to the beginning and try option 2 or option 1. It’s less than ideal, for sure, but if support has done nothing, there’s nothing you can do about it. 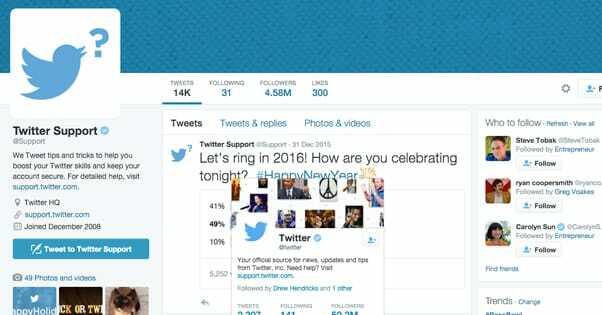 Your Advertisement on Twitter Ads was Denied: Now What? How can I contact an employee of Twitter directly? That’s not possible unless you personally know someone from Twitter. My twitter app does not work on my IPhone. I get an error message stating “Tweets are not loading.” Why is this the case? It used to work fine. What can I do? Try updating the app and/or updating the phone software. If neither work, go to your phone settings, find the twitter app and delete it. Make sure you know your password first though! Once it has been deleted, re-install it as a new account using your existing address, email address and password. Nothing will be lost. A first step before deleting the account could be deleting the password and typing it in again. Thanks. Exhaustively satisfying article about particular theme. Such a shame that Twitter doesn’t have a really working reliable way to quickly contact them and resolve any Twitter related problem. As of Feb 2017, if you call the recommended phone number, you get a recording to the effect that Twitter does not offer any phone support. I also received no response on a support ticket (one week so far). The problem, if anyone knows about it, is that I am not receiving email notifications (except an occasional random one). This happened without my changing anything on the account. I tried every recommended step to restore the notifications to no avail. @graham_simms:disqus Did you eventually receive a reply and if so, after how many days ? Twitter keeps sending me a message telling me that no one will see anything I post for 12 hours, Not a suspension my account, but something different, Its like I am being censored. I’m not posting anything that is against any policy and their is no violation. I have been trying to reactivate a suspended account. When I change the PW it changes on a secondary account I added several weeks ago. It is like the new account took over my old account. Does anyone have an idea of how to fix this? Even going through their forms, when you’re done, you get this message: “Though we cannot respond to individual reports, the information provided helps us make Twitter better for everyone. We appreciate your help!” That’s of no use when it’s something happening to only one account. My personal account is fine. My business account is borked. That’s a serious issue, and having no way to get it fixed makes no sense. The phone number specifically says they don’t help people. I would like to add another account but I do not have a gear or a me icon to help me do that. How can I get help with that? I’m not sure what you mean by a ‘gear’ or ‘me’ icon but if you want to add another account, you simply need a separate email address. Twitter is going down the drain… stock falling daily, their political censorship seems to be more aggressive and now their videos and gifs only play half the time, the rest of the time is “The media could not be played”. I have the same problem as below: Twitter (or a hacker) changed all of my ID. Twitter then kept going back and forth between the two accounts I have there, turning them on and off, on and off. They have been both off for weeks now. I am not doing ANYTHING wrong. I’ve kept to all the rules. I just post soccer news. Tell everyone to not buy Twitter ads until they fix the damn “media could not be played” problem. It’s been more than a month since the problem started (when they rolled out their latest version) and it seems Twitter couldn’t care less so they won’t/can’t fix it. They put a little lock on my account, I imagine because someone didn’t like what I said. They did it first for 11 hours and I was a good girl, but then they did it again and haven’t removed it. How can I get help for this? did you try to go to your settings Cindy to remove ? Twitter suspended me over a month ago. They won’t allow me to do one single thing. I can’t deactivate my account either. I’ve contacted them at least 15 times just asking if suspended how long, or if I’m terminated just let me know. All I get is the canned response saying it may take a few days for them to complete an investigation. They’re playing a game. They can’t just answer a very simple question. Have been using my Twitter account daily for past 8 months. In that period I have had “suspicious activity” notices about 5 times with request to change PW. Today while using my account got notice tgat account locked and had to wait for new code to use to access account. What causes this? I can’t follow anyone. Haven’t been able to for a long time. I went through the automated process, and it said my account is not locked or suspended. So I sent in a general support request. No answer for over a month. Yeah I got that today, not looking good. Tried to open a new account but because I had no followers yet, it wa banned the moment I replied to a tweet from someone. Suspected as a bot, verified my phone by sms and came up with a tech error and couldnt try again.Im pretty much locked out of actually tweeting anyone it seems. Never broke a rule once either. Did you ever get an answer? I have same problem and I’ve even opened a new acct. I also am unable to tweet anything. Nothing sends. Did you manage to get this sorted? I have the same problem where I can’t follow any accounts and lost all the accounts I was following. Twitter has permanently suspended my account due to “targeted abuse” shortly after I discovered other twitter users tweeting my IP address. I have not engaged in any sort of abuse. I have tried to appeal several times but only get automated messages and I cannot ask about hacking only ask about appealing my suspension. I cannot decide if I have been hacked (and messages sent in my name and deleted) or someone at the company has decided they just don’t like me. I need to get in touch with Twitter to find our what tweets they think I sent which led to my suspension. Any ideas what I can do? None that I can find, I’m in a similar boat. I was suspended for hateful conduct and I tried to appeal it only get a bot telling me it wont be restored so I sent another appeal in hopes of getting a person to review it rather than a machine. I am in the very exact situation. Can’t DM them, review, or deactivate my account. It’s so petty they can’t just provide any response that’s says anything. Can someone, anyone!, tell my why I still only have 140 characters on Twitter? Yes, I only have 40 followers (which I don’t really care about) Why does everyone else seem to have 280 but not me? My account apparently is locked and Twitter is not accepting my actual phone number to let me unlock it. the problem i had was this people would follow me & they locked me out when I tried to do what they wanted I couldn’t get back in at all i had at least more then 40000 followers I’m not sure if there’s a limit or not ? My problem is that I accidentally messed up my birth date (April 10 2002, I had it as 2001 by accident) so when I it back to 2002, it said they were “temporarily logging me out of my account and deleting it since I’m not 13 years of age.”. And obviously if you do math, I’m actually 16! Twitter shouldn’t do this! And I can’t log back in bc they said they were going to delete it, and I tried the phone number too, but that didn’t do sh*t! I’m panicking bc I had alot of stuff on there, and its also my account for my YouTube channel! If anyone can, please help! I’m experiencing the same thing right now! Was your problem fixed? And how? My account got locked and haven’t heard anything from them since. My guess is that they don’t care to help people. My account says it’s locked when I changed my birthday to July 25, 2003. And it says my account must be older than 13. I’m almost 15 and I’m pretty sure that’s older than 13. After posting some beautiful pictures of Jupiter from nasa my organic tweets show up as sensitive and cannot be seen by my followers. I have no way of getting help and have tried. It has been two months- I received no warning, but some of my followers told me about it. I have already checked all privacy settings so any suggestions appreciated. I had just finished posting a comment on Twitter and I’m suddenly locked out, because they said that I violated their policies. I would like to know what was the specific thing that I supposedly did wrong. My only conclusion is that it was a tweet that I had just commented on. …I had just typed out my response to someone, regarding a political post, and as soon as I hit the post button, they locked me out. In this age of world-wide instant communication with all and sundry through the internet, it becomes more and more difficult to communicate with the corporations that provide the means of such communication. Try contacting Amazon, TalkTalk or….Twitter. I’ve often gone round in circles, trying to email or snail-mail companies, but usually their websites send me back to a passive FAQ list. I avoid phoning because (a) it’s often expensive (b) I hate the “on hold” music, and (c) I have problems with strong Asian or American accents. I once had a twitter account. I decided today that I might sign up again. I entered my email address to be told it had already been claimed. I tried to contact Twitter to sort this out, but I never found a way, unless I logged in(!). I can understand that these companies are not interested in complaints, but I suppose we all have to get used to the idea that, where a customer base is so vast, each single customer is a drop in the ocean. I created my account a long time ago when I was 12, and i’m now 18, so i changed the birth year to my real one and have been locked out for a week because the account was created when i was 12. I’ve submitted a form, and have gotten no emails regarding progress unlocking my account. Has this happened to anyone, and how long did it it take to get your account back? This happened to me yesterday (4/7) and I’ve sent an email asking someone to please help me and now my account is suspended. I’ve had this account for 8 years and now they’re wanting to verify my age. If they don’t want you to have an account before you turn 13 then maybe they should’ve asked for a driver’s license in the first place when you create an account. And legally, I don’t believe they can ask for an actual copy of your driver’s license or birth certificate.